along the shores of the famous Bras d'Or Lake. It has approximately 600 people. 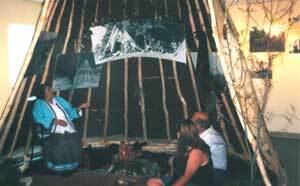 offers an interpretive learning experience and welcomes you to experience Mi'kmaq culture. Building: 28,700 sq. ft; Museum: 1,576 sq. ft. 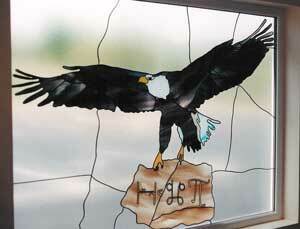 In the main foyer of the Centre, a stained glass window with a flying eagle. Dedicated to learning and reviving the Mi'kmaq culture in the First Nation community of Wagmatcook and beyond. An excursion through time. Mi'kmaq guides interprete their culture and traditions, and give a glimpse into the lives of their people, through the tales of the centuries. Noteworthy are the stained glass work (picture above), the Mi'kmaq murals by Arlene Christmas (Dozay) and, in the Great Hall, the vaulted ceiling. 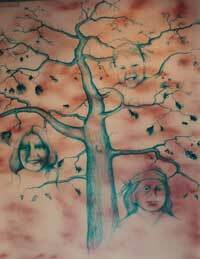 Above, a mural by Arlene Christmas (Doray) depicting a grandmother telling her grandchild a story. In the background, a glimpse of the Museum (canoe; teepee; petroglyphs). 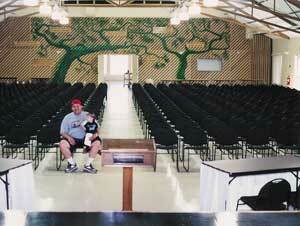 The Great Hall (6500 sq. 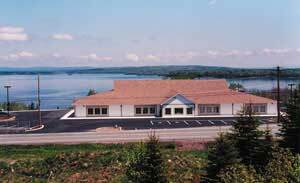 ft., overlooking the Bras d'Or Lake) is used for conferences and social gatherings. It also features entertainment such as drumming, dancing and storytelling. *	enroll in a course of Mi'kmaq dancing, drumming and language. 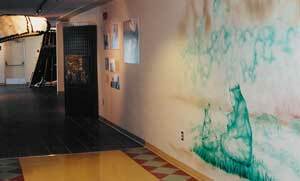 Another mural, called "History Makers", can be seen in the Clean Wave Restaurant. 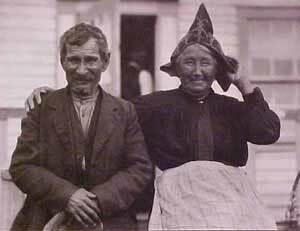 The history of the Wagmatcook people dates back centuries. However, the reservation was not officially established until May 2, 1834 by his Excellency Sir Peregrine Maitland. Maitland has been referred to as a gentleman who did not accede to the wishes of the Scottish settlers to remove the Natives from the mouth of the West-Side Middle River. The operation of the Centre is part of Wagmatcook Band Council's 5-year development strategy. Future plans for the Centre include featuring travelling exhibits (medicinal and religious themes) and an interpretive village offering outdoor activities and marine opportunities. The Smithsonian Institute has some 4,000 artifacts from this First Nation community. Demonstrations on how crafts are produced, and their significance (i.e. that of the Dream Catcher legend). Tradtional storytelling of the Mi'kmaq culture, heritage, customs, beliefs and humor. Daily multicultural entertainment ~ feel our culture come alive in Mi'kmaq drumming, dancing and story-telling by spiritual leaders. Links to sites about: government, people, economy, culture, language, etc. Photos of Mikmaw people, their activities (catching and smoking salmon, making baskets, hunting for caribou, moose, bear and other animals). Recollections and voices of the elders. Narratives and photographs, hieroglyphics and petroglyphs, instruments and ageless crafts hold many stories. Real-size wigwam at the centre of the museum; various objects (ash splints, furs, baskets, bear skin, etc.) evoking everyday life. "Let Us Remember The Old Mi'kmaq"
annual celebration of St. Anne's Day. Over two years, exhibition curators met with more that 50 Mi'kmaw elders throughout Nova Scotia to discuss these images. They drew on the memories of these and other present-day Mi'kmaw people, as well as historical information, to provide context for the images within 20th century Mi'kmaw experience. the message coming from Niskam, the Great Spirit. the unspoken - patience, active listening. of the supernatural race, he lives in lakes; the horn is the source of his power. peace amongst nations, families and individuals. the faith and wisdom of the First Nation communities. Chief Mary Louise Bernard, Chair; Nancy Bernard, Tracey Boutilier, Sylvia Googoo, Martha Isadore, Howard Jeddore, Nancy MacDonald, Jim Morro. Museum of Anthropology, Vancouver, B.C. Ample parking area. Washrooms, craft shop, restaurant right in the Centre.